Hi everyone, hope you have all be well – its been an interesting couple of weeks for me that’s for sure! Before I introduce this polish I have to give a HUGE shout out to Holly aka MissHollyBerries – she deserves 100% credit for this polish. Why you ask? She’s the sole reason I was curious about this Indie brand and decided to purchase 6 HARE polishes as a birthday gift to myself. 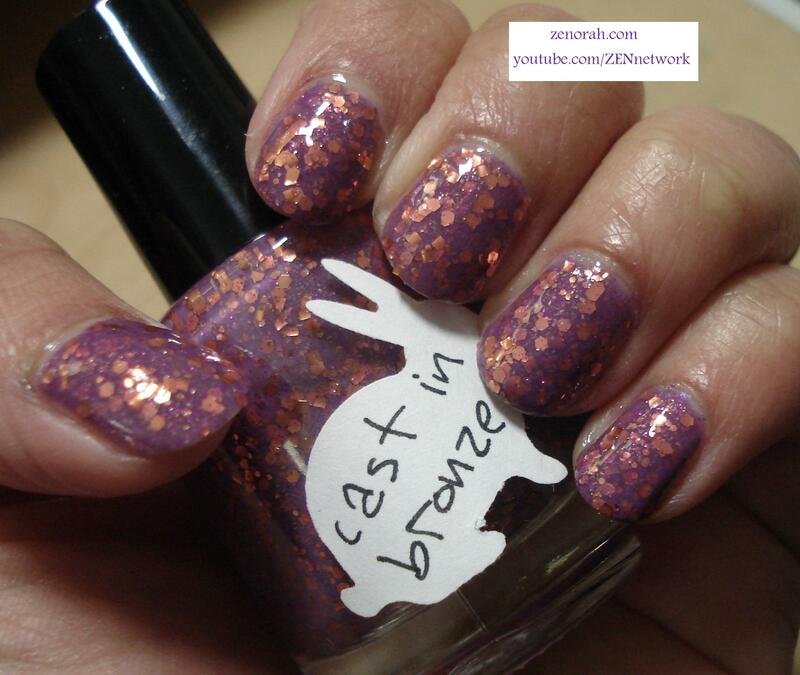 HARE polish Cast in Bronze – is a very dense dusty purple infused with different sized copper hexagonal glitter particles along with small square copper glitter particles. This is the first ever Indie polish from the HARE polish brand that I tried in my order and I have to say – this polish definitely gets major points for being unique. Sorry my hands are dry and gross – it’s weather plus working in the hospital constantly using alcohol sanitizers. 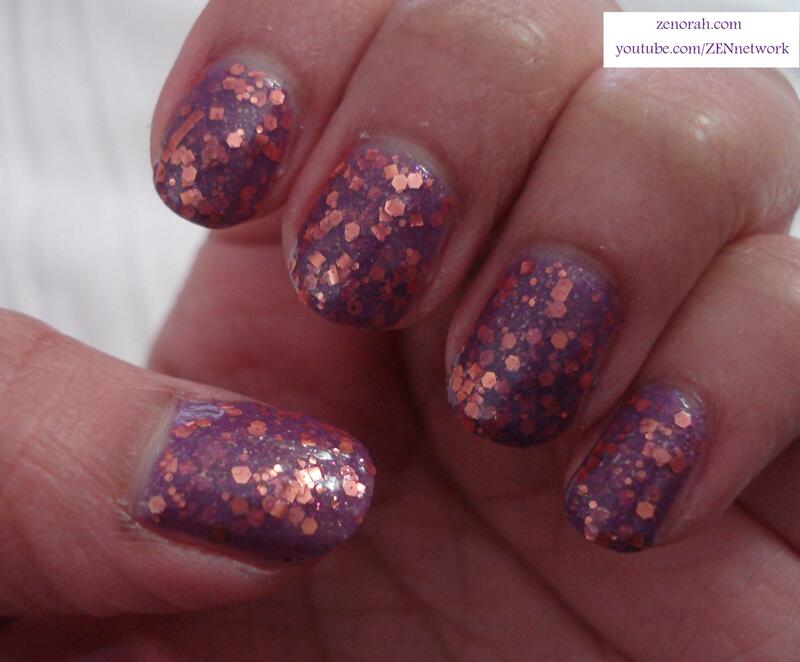 The manicure you are viewing was opaque on two coats and the glitter particles are very chunky and dense. This picture really doesn’t do the polish justice, it really comes alive in the sunlight -I love the demure yet vibrant purple and copper combination. After swatching all of my HARE polish chunky glitters I can safely say that HARE polish definitely reminds me of Deborah Lippmann chunky glitters. In my opinion, HARE polish is the quirky, off beat cousin to Deborah Lippmann – you honestly have to try her polishes. Now this manicure was opaque in two coats BUT it was a thick two coats – I didn’t mind at all because you really get your money’s worth in glitter. The dense glitter particles applied nicely across the nail beds but I did have to wait patiently between coats to ensure that the glitter particles did not drag across the manicure. The dry time really impressed me as well – dry within 10-15 minutes as well. The one thing I do have to mention is that, if you love a shinny manicure you MIGHT need to do two layers of top coat because my first layer sunk in – didn’t bother putting another one on because I quite enjoyed the look of just one. I highly enjoy HARE polish and for my first Indie brand they really set the bar pretty high. The removal was normal for removing glitter polishes, overall I am pretty excited to try the rest of my HARE polishes and I highly recommend trying them if you are a nail polish junkie. 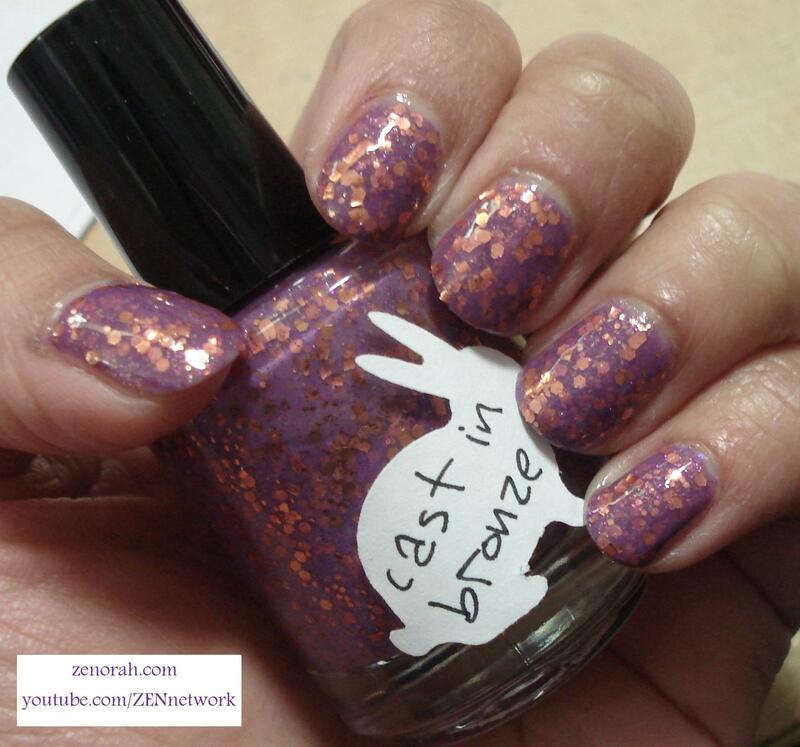 Do you own HARE polish Cast in Bronze? What are your thoughts on this nail polish? this looks soooo good on you! i ordered this polish too but haven’t been able to wear it yet. i don’t know if i’ll be able to pull it off as well as you tho. can’t wait to see dog day dream! Oh you will rock this polish!! can’t wait to see it on you!! and i absolutely LOVE Dog Day Dream, I can’t believe it isn’t sold out! I am thinking of a back up!